The city is, or could be, a self-aware hyperorganism. 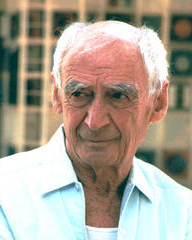 Paolo Soleri was an Italian-American visionary architect and lecturer in the College of Architecture at Arizona State University with a life-long commitment to research and experimentation in design and town planning. He spent a year and a half in fellowship with Frank Lloyd Wright at Taliesin West in Arizona, and at Taliesin in Spring Green, Wisconsin. He coined the term arcology, a portmanteau of "architecture" and "ecology", a field of creating architectural design principles for very densely populated, ecologically low-impact human habitats. In 1970, he began constructing Arcosanti, an urban laboratory testing ground for this idea. Among his more interesting legacies are the urban effect philosophy (or esthetogenesis: a description of the universe's general propensity to reshape itself into complex conscious structures), and his extrapolation of a hypothetical cosmic endpoint called the Omega Seed.